The words ‘shooter’ and ‘simulation’ don’t often populate the same sentence, especially when using them in relation to Nintendo Switch. You’re more likely to empty a magazine into an alt-history Nazi in Wolfenstein II or riddle knees with arrows across the unforgiving tundra of Skyrim. But now Nintendo’s hybrid machine has another, very niche, dimension to its FPS throng - the humble hunting simulator. 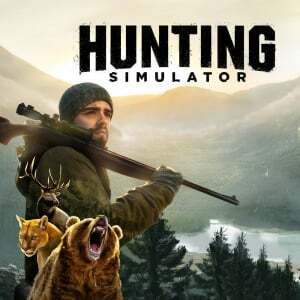 This game is actually called Hunting Simulator, just so there’s absolutely no confusion as to what you’re buying. There’s no semi-cryptic Deer Drive Legends or The Hunter: Call of the Wild nonsense here. It doesn't even use the word 'Cabela' anywhere. It's just a simulator that lets you shoot defenceless animals in the face from the comfort of a nearby hill. If you are a shooter fan, this is not the kind of fast-paced, death-dealing frag fest you’re used to. This is the anti-DOOM; a slow, measured experience that purposely makes you take care with every step, punishing you for making too much noise or failing to take note of the wind when it changes. It's an experience that demands a great deal of patience. To get the most out of it you need to leave your usual shooter muscle memories at the door. You can sprint, but you’ll never use it (not unless you want every animal on the map to immediately run like the clappers). You’ll boast a couple of shotguns or sniper rifles at any one time but you’ll use them sparingly. The game’s own mechanics are often at odds with one another, the strength of one system ultimately dragged down by the mediocrity of another. For instance, the gunplay is quite forgiving. 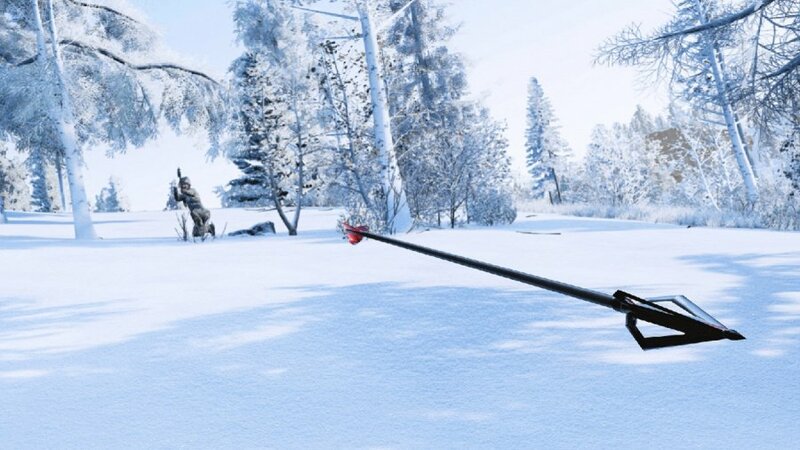 There’s no consideration given to bullet drop or wind sway, so at its core, you’ll simply hold your breath and shoot, a successful shot producing a Sniper: Ghost Warrior / Sniper Elite-style bullet cam. The act of hunting is also solid. The myriad species that populate its 32 maps (which cover everything from the mountains of Colorado to the snowy drifts of Alaska) all boast very different levels of perception. Deer, for instance, have exceptional hearing so you’ll need to crawl to a good vantage spot. Meanwhile, bears or wolves can smell you a mile off, so you’ll need to use a chalk-like item in your inventory to check the direction of the wind to ensure your scent isn’t needlessly alerting them to your gun-toting presence. 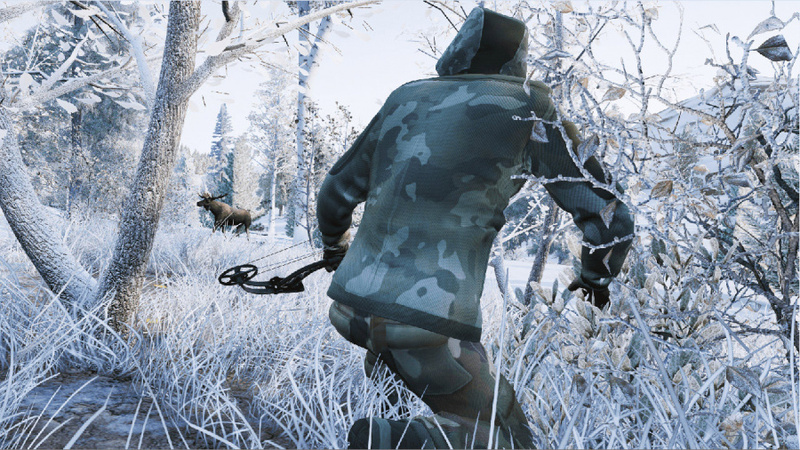 Combined together, those two elements of Hunting Simulator are immensely rewarding, but they’re let down by an artificial tracking system that robs each map of a true sense of life. When you enter a map for the first time, you’ll see a series of white marks scattered across the map. These are usually droppings, which when checked, will reveal the type of animal, the amount of time elapsed since they were made and a few seconds of tracks to show you in which direction the animal went. The problem is, these tracks aren't made by animals in real time. In fact, the beasts themselves don’t make any tracks at all. Your own avatar - which can be chosen from a series of laughably poor character models in the menu - leaves tracks, yet for whatever reason, your prey does not. These tracking spots are instead generated by the game in advance, presenting you with a rough circle on your map where your chosen target species may be grazing. Even if you wound an animal, there’s no blood trail to follow, which is doubly frustrating if you strike an animal but fail to mortally wound it. Bodies will appear on your HUD, but hurt animals often disappear as they bolt from the map. Considering much of the game’s core premise is based on investing a great deal of time - from slowly crawling around a map, to setting up the perfect shot - this unreliable tracking system too often ruins a hunt. You also have to complete all the hunting challenges on a map - which require you to kill and collect the carcasses of specific species - in order to unlock the next. 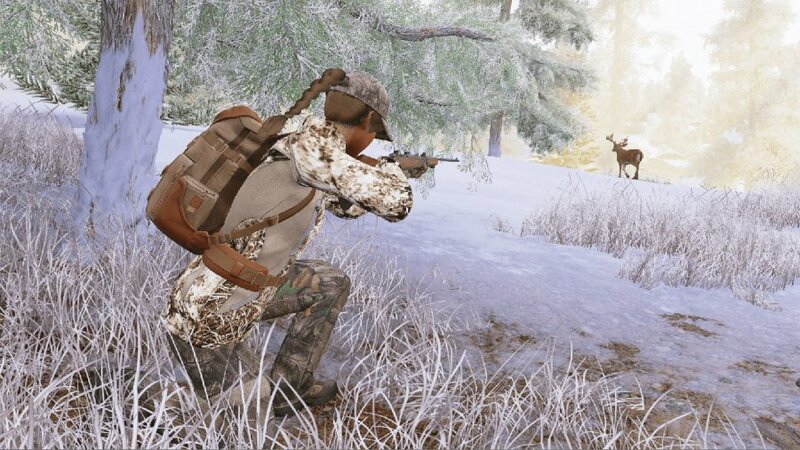 It’s a system designed to make you get the most out of one map at a time, but considering most are sparsely populated collections of rocks and trees, the result is an experience that fails to consistently reward those without the time-honed patience of a veteran virtual hunter. This Switch port runs surprisingly well, with most slowdown resigned to menu navigation rather than actual hunting gameplay. Environment textures and lighting are rather basic on the whole, but animal models and gun details are actually quite impressive, considering the hardware the game is running on. With plenty of modes to choose from - ranging from Free Play to a Shooting Range - there’s a decent level of parity with other versions found elsewhere. There are also motion controls, but they're not well-suited to the constantly moving targets Hunting Simulator presents you with. While it's not the best looking FPS on Switch, Hunting Simulator still manages to offer an experience that brings something new to the console’s growing library of software. The issues with its tracking system will rankle both veterans and newcomers, but if you can move beyond this roadblock then the bullet mechanics and actual minute-to-minute hunting have plenty to offer. Just remember to pack some sandwiches before you head out, because this is no ‘pick up and play’ purchase. I'll be hunting for better rated games. A kind of game I'd be able to literally burn inside of a store if I saw it on shelves. I really HATE that kind of game. @Cobalt Don't be that guy please. @Cobalt You ever play a shooter? There are plenty of those where you can kill humans in a "realistic" way. I'm no fan of sport hunting but that argument is shaky at best. Killing humans is a natural habit of humans. It´s stupid. But even more stupid is to kill defenseless animals as a sport or fun game. This game doesn't appeal to me, but you could argue that you'd rather people play this than harm real animals. That's food (farmed, not hunted) for thought. I am unable to comment on this without being offensive or starting a political discussion. So I will just ask, when do we get a City Simulator game on Switch? Can we get some Cities Skylines? That's more my kind of thing. "when do we get a City Simulator game on Switch?" @Heavyarms55 That's a great question I've been thinking about lately too. Hook us up with some sort of SimCity or Skylines. I'm the way I am. Killing humans in a video game is not great for me too but if you ask somebody like me what is more logic between killing soldiers in a war game or animals in a hunting game, I'll go instantly for the first one. @JHDK yes but there isn’t a game where the only point of the game is to realistically kill humans. In all other shooters there at least some reason to kill. This game is killing for the sake of it. Not for me. 200% OK with you ! @JHDK hunting animals has featured in so many games. I’d play this game and I’d never hurt an animal and I’m against any sport involving any animals. I’m against wars of any kind and yet I’d play a war game. I’ll never play In the NFL and I’ll play madden. @Cobalt If you dislike a genre and don't play it, fine. But hating a genre so much that you wish to destroy it, which implies you don't believe anyone else should play it either, is incredibly arrogant. You don't get to decide what I can play; I get to. It was a mindgame dude ! Do you really think I'll be that crazy to set fire in a store ? REALLY ? The Hunter: Call of the Wild is one of my favourite games, however this appears to be rather lack-luster rip-off... I'll be sticking to CoTW for my deer hunting fix (besides the GFX on the PeeCee are amazing). Nice try tho. @Cobalt To be fair, you did say "literally". @Kit Agreed, this is pretty lack luster. The most disappointing thing to hear is probably the (hobbled) tracking system. Guess i'll have to wait for Cabela's or buy one on the Wii or PC. @Stocksy Oh man, hunting in Assassin's Creed III was fun! I liked that in the AC games you were encouraged to hunt without firearms for better skins, as well. My biggest dig on game hunting IRL is when folks use souped up weaponry and baits. It's like getting a strike in bowling when you've got the lane bumpers in use, haha. @Cobalt No, I don't believe you'd commit arson. But with that attitude I do believe that if you had the power you'd prevent games you don't like from being produced. I'm thankful you lack the power. That's true, I used "literally" to support my point. To give more "power" to my sentence. But if I'd say : I'd be able to literally fly to the moon... You'll understand that it's an image, isn't it ? Sadly I agree, this could have the potential to act as a 'gateway' to folk whoy not otherwise of thought about maiming/killing defenceless animals. I don't advocate those actions at all. @Cobalt I understand, you're just not using the word "literally" correctly. Stupid non-native speaker spotted ! @Cobalt You used literally in the wrong way though. Literally means that it would happen in a literal way; an actual way. @Bod2019 Someone that spent at least $340 to play this game, by your logic, would then be tempted to go spend hundreds of dollars more on a firearm, get a hunting license, travel to hunt, and kill an animal? That's a reach, are you sure you didn't try to ban Night Trap? Also, those who "maim" animals are often folks that have never played hunting games or gone hunting. It is most often folks with psychological issues, and involves small animals or cats/dogs. I live in the southeastern US, and while I have used firearms I have never hunted game. I don't need to, I get food from the store that other folks have hunted first. But some folks I do know that hunt are very respectful about it and actually use the meat for themselves and donate some. There's things we need to have an open mind about. Every judgement should be cognizant of the actions and outcomes. I understand ! My mistake. If I wanted to play a game where I just go around picking on animals for no good reason, I'd play some Xenoblade Chronicles, but I didn't like it then so I doubt I'll like this now. Am hoping we also get a fishing simulator. This game looks OK but the reviews have been lukewarm. I'd get it if it wasn't so damn expensive. I'm saving those prices for games like Octopath,DK and Skyrim and a few more. £15 would be my limit on this. Perhaps someday it'll have a 50% sale. @Cobalt Well, I mean, you can literally commit arson. You can't literally fly to the moon under your own manpower. I think I've played this hunting simulator in The Last of Us. Oh Deer! What a dreadful subtitle for a review! Anybody that threw the baby penguin off the cliff in Mario 64, has no right to be offended by this game. Is there a kind of jealousy ? You know, one day you'll become a big boy too, I swear. Generally, after puberty you'll feel a change deep inside of your body and your soul. Be patient kiddo, your turn will come. @Cobalt Ok. You have issues. Dont be so defensive. It is almost like you had a childhood hunting accident and you are scarred for life. Sounds like they had a good Idea, but just didn't go the extra mile. If you're looking for a joke and have fun of me, you'll get it. @Cobalt there's a bit of jealousy. I wish I could still get amused by trolling 101. Surprised to see this post have the most comments of all the stories so far today. Came to read the comments. Not disappointed. "there's a bit of jealousy. I wish I could still get amused by trolling 101." I have no interest in hunting...yet I am not a vegetarian. Basically Ill eat someone else's kill. That makes me a bit of a hypocrite. But now that we've gotten that out of the way...hunting games do nothing for me...at least games where hunting is all there is. Games like Far cry and others are different...because its more than hunting, and in far cry you actually use your kill for something purposeful. 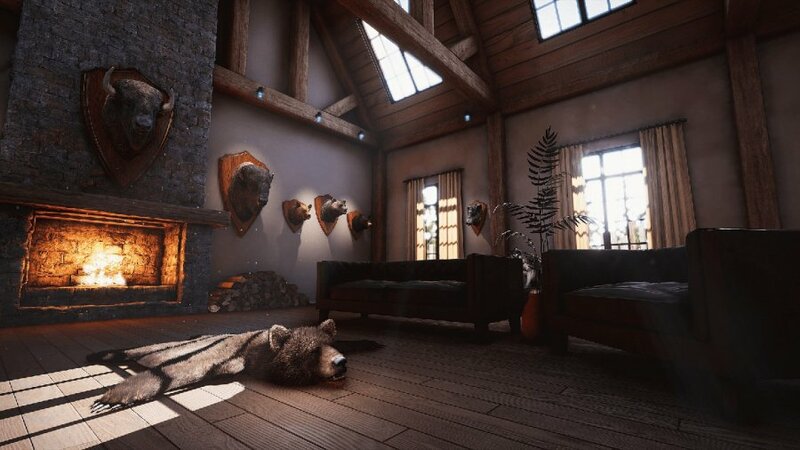 I dont see anything wrong with a hunting simulator...it just isn't my cup of tea. It'd be nice if these simulators focused on hunting for food and not sport hunting. Not sure how this one fares in that regard. @Stocksy but the point is this game is all about the hunt and nothing else. In Zelda you hunt for a reason. In all the games you listed hunting is for a reason and is not the reason etre. Personally I have nothing against this game existing. But I don’t want to play it. Now if it was a survival sim I’d be much more inclined to pretend to kill animals as it’s be for a real (pretend) purpose. Are any of these hunting games ever actually good? Any of them I’ve seen range from mediocre to shovelware. Thanx dude ! My pleasure. I'll stick with "Legend of Zelda: Breath of the Wild" then for my (albeit non-existent) hunting simulation needs... though with the Champions' Ballad DLC, that game very quickly turned into more of a "roadkill simulator". Now all Link needs is an "I Eat My Roadkill" bumper sticker and mudflaps for the Master Cycle Zero. Doesn't seem like a good hunting sim with no tracks and no blood trails. I mean, how can you actually find animals then??? The best hunting game is still theHunter IMO. Nothing comes close to it. theHunter: Call of the Wild may have gorgeous environments, but the hunting is more arcadey than the original, which doesn't do it for me. For the record, I love animals and don't approve hunting for sport. Hunting games though are fun. @Bombdotorg999 IMO theHunter and the Carnivores (Dinosaur Hunter and Ice Age) series are the best hunting games. People say the early Deer Hunter games are very good, but I've never played them. Hunting Unlimited 2010 and the Carnivores remake are decent. Lots of games, like the Cabela series, though, aren't true hunting sims. They're just glorified arcade shooters. In short, all the good hunting games are PC-only, although some of them, like Carnivores, are on mobile as well. I was actually somewhat intrigued by this, if it featured something else to do with your hunt other than a trophy. I believe in hunting for survival, food, and to make use of the kill. In real life I target shoot, but have never hunted. Firstly, the act of cleaning a fish can turn my stomach from time to time, couldn’t imagine larger game.... secondly, I couldn’t make use of the kill as I don’t like the taste of wild game usually, so it’s pointless for me to hunt. Hunting in real life is something humans have done for thousands of years, and is a lot less grotesque than popping a cow in the head while it’s in a box just so some people can have some hamburgers. But either way, it’s a necessary evil. Humans need to eat. And as long as hunters obey the laws, there’s nothing wrong with it.... I’d have to stand by it. Over population of certain species, like Deer or Coyotes, can lead to ecosystemic destruction that would extinct other species. @Cobalt Kinda odd how you only seem to take such offense to games where animals are hunted for sport when there is so many games where humans are hunted down and killed just for the heck of it. @beazlen1 Are you kidding? There is a ton of games that are all about trying to kill people realistically just because you can. It seems like some people here are extremely unfamiliar with video games. @PanurgeJr The kind of people who try to act like they are holier than thou for their political beliefs and/or personal taste are among the worst kind of smug people you can encounter. They are usually some self-absorbed narcissist who rages at everyone with a contrary opinion. "Kinda odd how you only seem to take such offense to games where animals are hunted for sport when there is so many games where humans are hunted down and killed just for the heck of it." I'm one of the ten people on the internet who do not hunt but recognize the important role selective licensed hunting plays in controlling animal overpopulation and maintaining equilibrium in local ecosystems, and I'm a bit on the fence on this one. Disappointed to see it has some shortfalls that affect the hunt. I would like to see a well-executed multiplayer hunting experience with a gameplay focus on tracking as a team, hunt preparation and the full use and handling of the carcass. A true-to-life hunting experience which accurately portrays the sustainable ecological benefits hunting affords the environment would be a refreshing sight in a time when miseducation, simple ignorance, and social chameleon outrage reign supreme. @JayJ yes but in those games you’re killing for some sort of a purpose such as robbing a bank, defeating the Nazis, trying to survive the zombie invasion etc etc. In this game the killing is for the sake of killing. That is the only point I was making. Will I buy it? no because it sounds a bit boring. If it had some story progression and wasmore like a survival / hunting simulator then I’d be seriously tempted. @beazlen1 Hunting animals has traditionally been for survival, and in many parts of the world it is still a survival necessity. Just because you have the luxury of living in a highly developed part of the world with plentiful food where all of your animals are killed for you doesn't mean everyone in the world also shares the same ease of access. In any case, there is a great deal of action oriented games that essentially have you murdering people for next to no reason so I don't see how something that tries to simulate a necessary means of survival is so bad. Even if it is focusing on the sporting aspect, it is still the same process as is done for hunting for survival. In any case we are talking about virtual animals, computer generated fantasy, if you are treating this as reality that is your own personal issue. @Agramonte These overgeneralizing political jabs are so dumb. It's uncalled for. I am a Trump supporter (don't agree with everything he's done, but I'm not going to get into a pointless discussion in the NL comment section regardless). Comments like yours have no net positive effect. It just serves to increase the vitriol and divide in America. @Agramonte NRA supporter too. I'm just not a fan of overgeneralization period. So easy to say "everyone in this basket acts this way" and have it not be true. @GrailUK totally killed that penguin baby several times. @JHDK Exactly! I heard Cities Skylines was coming, or has already come to PS4, so I am hoping we can get a version on Switch too! @DragonbornRito yeah man, but we talking about silly videogames. Its like a game about a bagels making factory and saying - that is what New Yorkers would play if they had a Switch. Or cops with donuts - not really an actual statement. @DragonbornRito I agree completely, and you have my respect for showing the courage to state your opinion of the game and your support for conservativism. This is the age of "tolerance", after all! Too often are millions of quiet conservatives intimidated, dehumanized, and bullied into silence by the groupthink-driven cult-like behavior of individuals who are conditioned to antagonize and belittle the worth of those with whom they disagree on the assumed and simply ironic basis that those views antagonize and belittle the views of others. @Cobalt Hot Wheels are rad, yo. Try harder plz. @Darlinfan "Hot Wheels are rad, yo. Try harder plz." So do get to skin and cut the meat from your hunts? That would make it more interesting. People. Instead of complaining about Cobalt - just block him/her. I blocked them an age ago, and it makes for a much more pleasurable reading experience - only interrupted by those who quote them, ruining the flow of conversation. @Ryu_Niiyama You...monster! Hehe, if we are all being honest, we all did it lol. The fact that prey doesn't leave trail is surprising for a "Hunting Simulator". Not my kind of game, but I see the appeal. Games with hunting as a side activity (like mentioned Breath of the Wild) satisfy my virtual hunting needs. @JayJ I’m not sure where our disagreement lie because I pretty completely agree with you. I was merely pointing out that this game seems to be killing for the sake of it and therefore I’d probably find it boring. So I’m not gonna buy it. Give me demons or Piranha Pete to slay any day. How do you all feel about Monster Hunter? My sweet little rascal, you bring light to my life, ya know it ! I'd like to take action. To change your diapers for example but sadly, we live so far away from each other that I can't. Life is so cruel, sometimes ! Being called a loser by you is the highest compliment ever ! Take a minute to think about it ! Oops, I forgot it was you, take a decade to think about it then, son ! Wow, jump on the guy who expresses an opinion. I don't particularly care all that much to be honest, I exist and generally am kept busy with that. For what it's worth I don't particularly see the point of people owning guns for 'leisure/pleasure' seems to be a recipe for disaster, which I believe is a pretty well proven point given the state of gun crime on the US. I have no evidence, no research or for that matter any further insight than what I stated before which is simply, via experiencing a game trying it's best to simulate a real life act (ie hunting) I could well 'imagine' someone may then think 'you know one day I may be tempted to give this sport a go'. Because let's face it, it's not that much of a stretch for someone to make. Certainly less of a stretch than someone playing GTA and deciding to replicate some of that content. Like I stated at the top of this comment, it is merely a comment, nothing I say has to be taken as fact. Fact of the matter is people do shoot animals for sport, it's their hobby, I'm probably a bit soft and just think is it really necesary? I grew up on Doom, Cabela's Hunting Simulators, Mario, among many other things. I'll probably take a deeper look into this one to see if I'll pick it up, but I enjoy a good hunting simulator. @Bod2019 nah, no malice intended, chap. I don’t quite agree with the whole ‘hunt for sport’ mentality. It’s a waste of food to me. In this state, it’s even a crime to kill and leave deer. Every couple years I’ll read a story of someone arrested because they beheaded a deer struck by a car, and attempted to leave the body. Big waste. And hiding in a deer stand with beers and a clip of 20 rounds doesn’t really take skill. And don’t feel I attacked your opinion, apologies if it came across that way through my words. I was trying to show another side. I also tend not to subscribe to the idea that just because an interaction or scenario exists, it will automatically make it more attainable or feasible to act out outside of that medium. It certainly can happen, but it’s not the determined outcome every time. Otherwise we’d have a generation of sick folk jumping on turtles everywhere. And there’s enough other sick folk that do things without video games or movies being involved. @DragonbornRito Trump is a traitor and the NRA is a terrorist organization. And if you think me vitriolic for saying so, so be it; I don't feel like falling for the standard conservative trick of asking people to be silent in the name of decorum. After all, isn't speaking his mind one of the things Trumpkins love about him? @PanurgeJr I'm not encouraging anyone to not speak their minds, I'm saying making inflammatory politically-driven jabbing comments on a video game website has zero positive effect. It unnecessarily riles up people who feel like they're being accused of something that is definitely not true just because they fall into said basket. Also, those are your opinions, which you're entitled to, but there is no certifiable evidence to either of those claims, especially the NRA being a terrorist organization... (Trump not defending the US from Putin's comments was not ideal behavior from our leader, but it takes a lot of mental gymnastics to call that traitorous.) There's just so many sensationalistic comments made these days just to appeal for emotional responses. And I'm talking about people on both sides of the aisle, especially Trump and many of his Twitter tirades. But go ahead and reply with the evidence I'm sure you have bookmarked (mentally or digitally) for instances like these. I still contend this is a silly platform for a discussion like this, no place for name calling, accusations, what have you. It's just a waste of time and finger energy. @DragonbornRito It takes exactly zero mental gymnastics to see that Trump is a traitor. Trump is a fascist, and that isn't name-calling, it's identification of political identity. Also, there is credible evidence that the NRA has laundered Russian money. That's one thing among many that aligns them with terrorists. I could go on. Did you even play it? @Cobalt do you feel that way about games where you kill actual people? or is that totally different?